Yesterday we found out Patrick’s kidneys are failing. The vet called us to confirm it, a few hours after our appointment that morning. My stomach dropped when I heard the words. We lost Chuckie to CRF and it was very hard on her as well as us. We also believe Patrick may have had a mild stroke. He’s been a little slow for a while, but this isn’t my alpha cat. The good news is he hasn’t given up, and he was back in the sun by mid-afternoon with his friend Stanley. Today we started the first dose of sub-q fluids. Patrick handled it a lot better than I expected. He put up a fight, but it did not last long. I think he’s too weak right now. Fluids have been a regular thing around here with Stanley. He’s been on them since arriving at Save-A-Pet. I have a terrible phobia of needles. I’m sure they can sense my fear. I spent a good amount of time today reflecting on Patrick’s time with us. I also spent a lot of time holding back tears. I’ve never known a more loyal cat. He would risk his life to defend his family and that’s been proven on at least one occasion. Now it is our turn to take care of him. I’m reading up again on Feline CRF and it’s bringing back many memories. I’m just grateful that we have a chance to make the most of our time with Patrick. 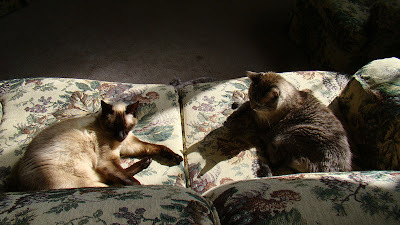 The original meezers.com blog was intended as a fun way for Gato to tell her story, from her own perspective. Since Stanley’s, and now Patrick’s condition, it just hasn’t been a priority. I’m pulling down the original posts and comments, at least temporarily. Thank you to everyone that has wrote and commented on Gato and the boys. For now, I want to write about Stanley and Patrick’s treatments, so others might benefit.